Married Name Her married name was Chamness. Mary E. (?) married (?) Chamness. Mary E. (?) was born circa 1861 at Indiana. (?) Chamness married Mary E. (?). (?) Chamness died before 1930. Name Variation Philip Decot was also known as Jesse. Philip Decot was born on 22 December 1912. He was the son of Edmund P. Decot and Pearl Chamness. Philip Decot married Evelyn E. Burgess, daughter of Elmer Burgess and Eva Hohn, on 23 May 1937. Philip Decot died on 20 January 1991 at Reedsburg, Sauk, Wisconsin, at age 78 Philip (Jesse) Decot obituary. Clinton Decot married Alice (?). Clinton Decot was born circa 1917. Clinton Decot died between 1991 and 2012. Married Name 21 July 1942 As of 21 July 1942,her married name was Vose. Wilma Ione Decot was born on 29 September 1919. She was the daughter of Edmund P. Decot and Pearl Chamness. 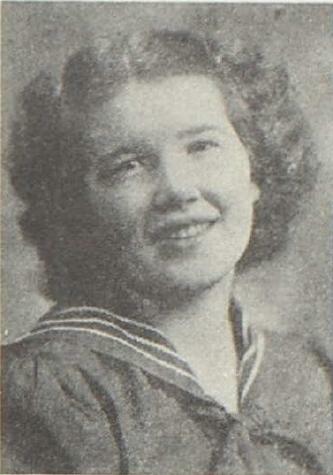 Wilma Ione Decot married Everett Vose on 21 July 1942. Wilma Ione Decot died on 21 February 2012 at age 92 Wilma Ione Decot Vose, 92, widow of Everett L. Vose, a resident of West Road, died peacefully Thursday, February 21, 2012 at Crescent Manor Care Centers surrounded by her family. Born in LaValle, Wisconsin on September 29, 1919, she was the daughter of the late Edmond and Pearl ( Smith) Decot. Wilma was a graduate of Reedsburg High School in Reedsburg, Wisconsin and Spencerian College in Milwaukee. Wilma came to Bennington on July 4, 1939. She managed the Bennington bus terminal during and after World War II where she met her future husband. Wilma and Everett were married in Bennington on July 21, 1942. Everett died May 27, 1984. Wilma and Everett owned and operated Wright’s Cigar Store, including the cigarette vending machine business and sporting goods business. She was also a bookkeeper at Bennington Garage and later owned and operated the Coin Bag and Bennington Launderette until the time of her retirement. She was a member of the “Bowlerettes” bowling team, once winning the Vermont State Championship title. Wilma served as a Red Cross Gray Lady at Putnam Memorial Hospital from 1958 -1966 and also volunteered at the Well Baby Clinic in Bennington. She was a member of the First Baptist Church where she served on many committees and boards. An avid gardener, she also did oil painting, mostly scenery. She was an excellent cook and also enjoyed crocheting and knitting. Her main interest was her family. Besides being a devoted mother and grandmother, she was a mentor and best friend and always there for her family. Wilma especially enjoyed holiday and family gatherings. Wilma is survived by two daughters and sons-in-law, Marianne and Mike Sawyer of Bennington and Linda and Jim Bishop of Shaftsbury; six grandchildren Wendy (Scott) Hutwelker of Bennington, Jamie (Teddy) Hill and Barry (Amy) Bishop of North Bennington, Scott (Aimee) Bishop of Troy, NY, Aaron (Allison) Bishop of Falmouth, ME and Amy (Steven) Deschane of Derry, NH; fifteen great-grandchildren and four great-great-grandchildren; a brother, Morres Decot of Hancock, WI and several nieces, nephews and cousins. Wilma was predeceased by a sister and two brothers, Reva Willis of LaValle, WI, Philip Decot of Reedsburg, WI and Clinton Decot of LaValle, WI. Private services will be held at the convenience of the family. Friends and family are invited to a celebration of Wilma’s life at the home of Jim and Linda Bishop, 484 Elm Street, North Bennington on Saturday, February 25, from 1:00 to 300 P.M.
Burial will take place in the family lot in Oak Lawn Cemetery, LaValle, WI on Saturday, March 3, 2012 at 11:00 AM. Should friends desire memorial contributions in Wilma Vose’s memory may be made to either the Southwestern Vermont Regional Cancer Center or the Alzheimers Association through the office of the Mahar & Son Funeral Home, 628 Main Street, Bennington, VT 05201. 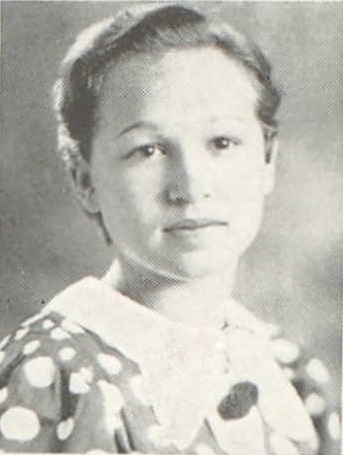 Wilma Ione Decot graduated in 1937 at Reedsburg High School, Reedsburg, Sauk, Wisconsin. Married Name Her married name was Willis. Reva M. Decot married (?) Willis. Reva M. Decot was born circa 1923. Reva M. Decot died between 1991 and 2012. Reva M. Decot graduated in 1940 at Reedsburg High School, Reedsburg, Sauk, Wisconsin. Name Variation Morris Decot was also known as Morres. Morris Decot was born circa 1925. Morris Decot died after 1991. Married Name before 1910 As of before 1910,her married name was Decot. Ida M. (?) was born circa 1885 at Wisconsin. She married Theodore Francis Decot, son of Eugene Decot and Marie T. Gasser, before 1910. Ida M. (?) died after 1930. Harold T. Decot was born in December 1917. He was the son of Theodore Francis Decot and Ida M. (?). Harold T. Decot was a groomsman at the wedding of Leona Zimmerman and Ewald Klipp on 25 August 1935 at St John Lutheran Church, Reedsburg, Sauk, Wisconsin. Harold T. Decot lived in April 2009 at 7302 Venice St, Falls Church, Virginia. Married Name before 1912 As of before 1912,her married name was Decot. Josephine Margaret (?) was born circa 1884. She married Charles Eugene Decot, son of Eugene Decot and Marie T. Gasser, before 1912. Josephine Margaret (?) died on 22 November 1951 at Richland, Wisconsin. John E. Decot was born circa 1912. He was the son of Charles Eugene Decot and Josephine Margaret (?). Frances T. Decot was born circa 1915. She was the daughter of Charles Eugene Decot and Josephine Margaret (?). Theodore E. Decot was born circa 1917. Name Variation Lawrence William Decot was also known as Bill. Lawrence William Decot was born on 19 July 1918. Lawrence William Decot married Ruby Jean Dowd, daughter of Henry Dowd and Jennie Rodwell, on 20 March 1976 at Richland, Wisconsin. Lawrence William Decot died on 23 November 1990 at Sauk, Wisconsin, at age 72. Lloyd McHenry married Molly Butcher. Lloyd McHenry was born on 13 November 1901 at Wisconsin. He died on 23 December 1965 at Wisconsin at age 64. Molly Butcher married Lloyd McHenry. Molly Butcher was born on 11 April 1902 at Wisconsin. She died on 6 March 1984 at Wisconsin at age 81. Married Name 10 June 1947 As of 10 June 1947,her married name was Bohen. Crilla M. McHenry was born on 18 April 1926 at Wisconsin. She was the daughter of Lloyd McHenry and Molly Butcher. Crilla M. McHenry married Raymond J. Bohen on 10 June 1947. Crilla M. McHenry died on 18 January 2004 at age 77 Crilla M. Bohen, age 77, of Reedsburg, died on Sunday, Jan. 18, 2004, at University Hospital in Madison. She was born on April 18, 1926, in Valley, Wis., the daughter of Lloyd and Molly (Butcher) McHenry. She was married to Raymond J. "Midge" Bohen on June 10, 1947. She was a devoted and loving wife to Midge, and was a very caring person to those around her. 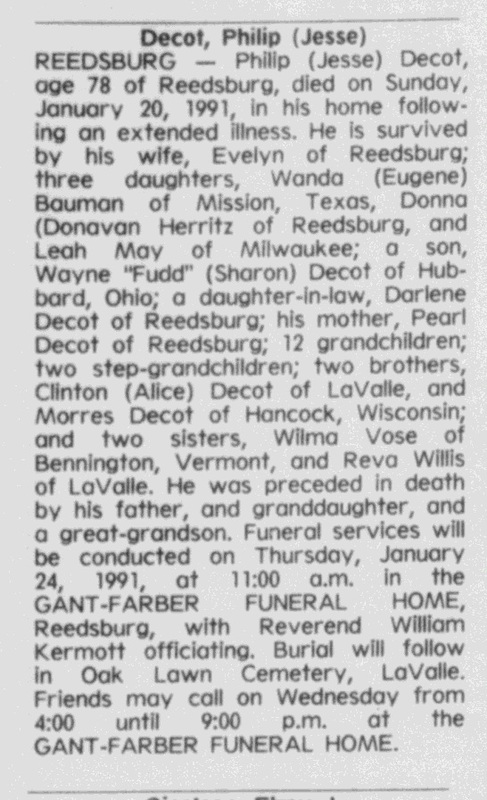 She is survived by her son, John (Mary) Bohen of Reedsburg; grandchildren, Travis Bohen of Reedsburg, and Jill Bohen; a brother, Conrad McHenry of California; brothers and sisters-in-law, Harold "Gadge" (Marge) Bohen of Reedsburg, Bob Bohen of Madison, Mary Hattleburg of Madison, and Ramona McHenry of Reedsburg; and nieces, nephews, along with other relatives and friends. She was preceded in death by her husband, Raymond, on Aug. 13, 1981; her parents; a brother, Ken; and sisters, Genevieve and Carmel. The Mass of Christian Burial will be conducted on Thursday, Jan. 22, 2004, at 11:30 a.m. in SACRED HEART CATHOLIC CHURCH, Reedsburg, with Father Thomas Monaghan officiating. Burial will follow in Calvary Cemetery, Reedsburg. Friends may call on Wednesday from 4 p.m. until 7 p.m. at the FARBER FUNERAL HOME, Reedsburg. A Scripture service will be prayed at 4 p.m. The Farber Funeral Home is assisting the family with the arrangements. Name Variation Raymond J. Bohen was also known as Midge. Raymond J. Bohen was born on 27 January 1923. He married Crilla M. McHenry, daughter of Lloyd McHenry and Molly Butcher, on 10 June 1947. Raymond J. Bohen died on 13 August 1981 at age 58. 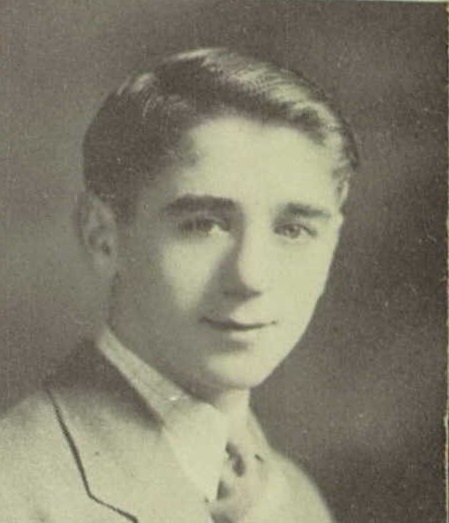 Raymond J. Bohen graduated in 1941 at Reedsburg High School, Reedsburg, Sauk, Wisconsin. Genevieve McHenry married Clarence A. Popp. Genevieve McHenry was born on 20 September 1922. Genevieve McHenry died on 23 May 1989 at age 66. Carmel McHenry was the daughter of Lloyd McHenry and Molly Butcher. Carmel McHenry died before January 2004. John Thomas Bohen was born on 23 December 1947 at Reedsburg, Sauk, Wisconsin. He was the son of Raymond J. Bohen and Crilla M. McHenry. John Thomas Bohen died on 15 May 2005 at Sauk, Wisconsin, at age 57 John T 'King B" Bohen, age 57, of Reedsburg, died on Sunday, May 15, 2005, at his home, following a battle with cancer. 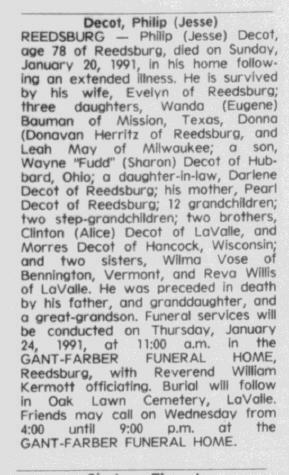 He is survived by his wife, Mary of Reedsburg; children, Travis Bohen of Reedsburg and Jill Bohen of Kansas; step-daughters, Ashley Cornwell of Baraboo and Jaime Cornwell of DeForest; a grandson, Riley; mother-in-law, Gert Haefer of Reedsburg; brothers and sisters-in-law, Susan (Mike) Wobschall of Loganville, Patsy DuVall of Merrimac, Sally (Dan) Thompson fo New Castle, IN, Trudy (Dale) Haney of Reedsburg and Peggy (Mike) Anderson of Reedsburg; uncles, Gadge (Marge) Bohen of Reedsburg and Bob Bohen of Madison; aunt, Mary Hattleberg of Madison; many nieces, nephews, cousins, along with other relatives and friends. Burial will be in Calvary Cemetery, Reedsburg. 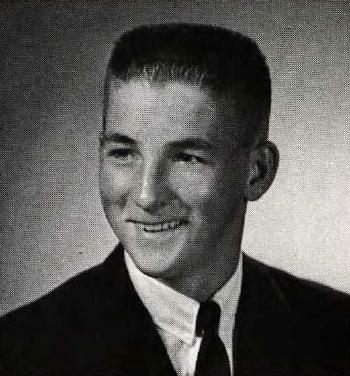 John Thomas Bohen graduated in 1966 at Webb High School, Reedsburg, Sauk, Wisconsin. Married Name Her married name was Schultz. Name Variation Ruby Jean Dowd was also known as Jean. Married Name 20 March 1976 As of 20 March 1976,her married name was Decot. Ruby Jean Dowd married Paul Sherwood. Ruby Jean Dowd married Elmer Schultz. Ruby Jean Dowd was born on 5 August 1928. She was the daughter of Henry Dowd and Jennie Rodwell. Ruby Jean Dowd married Lawrence William Decot, son of Charles Eugene Decot and Josephine Margaret (? ), on 20 March 1976 at Richland, Wisconsin. Ruby Jean Dowd died on 19 September 2008 at age 80 Ruby Jean Decot, 80, of Baraboo went to her heavenly home, Friday, Sept. 19, 2008, at her home. "Jean" was born Aug. 5, 1928, in Lake Delton Township to William Henry and Jennie (Rodwell) Dowd. She resided in this area her entire life and attended Lake Delton and Wisconsin Dells schools. Jean was employed by Weyenberg Shoe Manufacturing Company in Portage, Almet/Sunbeam in Baraboo, and Parson's Trading Post in Lake Delton. Jean loved long country drives on Sunday afternoons, dancing, singing, playing piano, bird watching, and surrounding herself with wildflower gardens. She was a history buff who continually researched her family origin and kept a dictionary at her side in the event she ran across a word or spelling she questioned. She was married to Paul Sherwood and Elmer Schultz, both deceased. She was married to Lawrence "Bill" Decot on March 20, 1976, and he passed away on Nov, 23, 1990. Her parents; two brothers, Donald and David Moon; and two Schultz infants also preceded her in death. Jean is survived by three sons, Jay (Lorna) Sherwood of Montello, Don Schultz of Wisconsin Dells, Dale (Cecelia Langland) Schultz of Lyndon Station; one daughter, Diane (John) Lee of Baraboo; 10 grandchildren; 17 great-grandchildren; one sister, Ila Prindle of Baraboo; nieces; nephews; and pets, "Sassy Kat" and "Sammy." Funeral services for Ruby Jean Decot will be conducted at 3 p.m., Wednesday, Sept. 24, 2008 at the Farber Funeral Home in Reedsburg with the Rev. Ray Harms officiating. Burial will follow in Butterfield Cemetery. Friends may call on Wednesday from 1 p.m. to 3 p.m. at the funeral home. In lieu of flowers, memorials of remembrance may be made to the Sauk County Humane Society in Baraboo. Lorna D. M. Decot was born circa 1912 at Wisconsin. She was the daughter of Victor Jack Decot and Lora M. A. Schuette. Name Variation Jurgen Heinrich Wilhelm Schuette was also known as William. Jurgen Heinrich Wilhelm Schuette was born on 11 October 1855 at Germany. He was the son of John Schuette and Dorothee Maria Hines. Jurgen Heinrich Wilhelm Schuette married Dorothea Mueller on 31 January 1886. Jurgen Heinrich Wilhelm Schuette and Dorothea Mueller were divorced before 1920. Jurgen Heinrich Wilhelm Schuette died in November 1925 at age 70 William Schuette died Tuesday morning after a prolonged illness at the home of John Springbrun in this city, after a long illness. He was born in Oldenstadt, Germany, October 11, 1855, and came to this country in 1872. He was well known as a farmer in this vicinity, until his retirement. Mr. Schuette is survived by his wife, one son, Walter; and three daughters, Laura, now Mrs. Victor Decot; Amanda, now Mrs. Oscar Olson; and Veona, now Mrs. Mittlesteadt, all of whom live in the vicinity of LaValle. Two sisters, Mrs. Dora Ellenberg, of this city, and Elizabeth, in Germany, also survive. Funeral services will be conducted by the Rev. C. A. Hardt, at the Springbrun home and at the St. Peter's Lutheran church in this city. Taken from the Reedsburg Times of November 6, 1925. Jurgen Heinrich Wilhelm Schuette immigrated in 1872. Name Variation Dorothea Mueller was also known as Dora. Married Name 31 January 1886 As of 31 January 1886,her married name was Schuette. Dorothea Mueller was born in 1864 at Germany. She married Jurgen Heinrich Wilhelm Schuette, son of John Schuette and Dorothee Maria Hines, on 31 January 1886. Dorothea Mueller and Jurgen Heinrich Wilhelm Schuette were divorced before 1920. Walter Schuette was born on 12 May 1890 at Wisconsin. He was the son of Jurgen Heinrich Wilhelm Schuette and Dorothea Mueller. Walter Schuette married Alma Catherine Frieda Behn before 1921. Walter Schuette married Elsie Behn on 11 February 1923 at St John Lutheran Church, Reedsburg, Sauk, Wisconsin. Walter Schuette died before 1991. Amanda L. Schuette was born on 20 December 1893 at Sauk, Wisconsin. She was the daughter of Jurgen Heinrich Wilhelm Schuette and Dorothea Mueller. Robert Schuette was born on 29 January 1898 at Sauk, Wisconsin. Robert Schuette died before November 1925. Name Variation Frona P. Schuette was also known as Verona. Name Variation Frona P. Schuette was also known as Veona. Married Name circa 1920 As of circa 1920,her married name was Mittlesteadt. Married Name circa 1920 As of circa 1920,her married name was Mittelsteadt. Frona P. Schuette was born in 1901 at Sauk, Wisconsin. Frona P. Schuette married Carl Reinhold Herman Mittlesteadt, son of Marie Mittlesteadt, circa 1920. Frona P. Schuette died in 1975. Name Variation Catherine Dorothea Elisabeth Schuette was also known as Dora. Married Name before 1875 As of before 1875,her married name was Ellenberg. Catherine Dorothea Elisabeth Schuette was born on 9 May 1851 at Germany. She was the daughter of John Schuette and Dorothee Maria Hines. Catherine Dorothea Elisabeth Schuette married Johann Heinrich Friedrich Ellenberg before 1875. Catherine Dorothea Elisabeth Schuette died after November 1925.